The other week I posted about how my winnings had continued, with the fantastic Wire Home Furnishings Giveaway that Wendy had hosted. Well, after some humming and hawing and discussion with B, it was decided that even though I love the Eames Style Side chairs that were on offering, they didn't really go in our home and we really didn't have room for another chair. I know... believe me, it killed me to admit it, but it's true. SO, in the end B and I decided on the Mini M Table Lamp in Silver... we're seriously lacking in task / mood lighting in our home. Our thoughts were that it would be perfect in our newly finished front entrance. 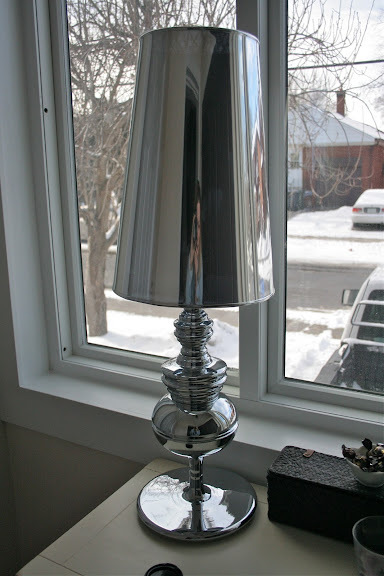 Of course, I had neglected to actually look at the height of the lamp on the website... so B and I were surprised at the size of the lamp when it arrived on our doorstep only a few short business days after ordering it. It spent over a week sitting in our living room waiting for me to find it the right home. Because of the size I had a feeling it wouldn't be right for our front entrance, but after placing it there the other night while cleaning up, both B and I are starting to think it's actually exactly what we needed on our little console table in there. It adds a little height to everything else that is in there (I still need to do a bit more accessorizing), and a little glam. We have yet to add a bulb or even plug that bad boy in, but it's coming! What do you think of our new lamp and it's new home? I know, it's a huge tease since you haven't got a good post on the after of our front entrance. Well the photos have been taken and the post is together and it's coming tomorrow! I promise! Can't wait to see it all together tomorrow! Nice teaser ;) The lamp looks great. It probably looks great from the street too. I'm imagining little PEANUT fingerprints all over it! That's pretty cool, my friend!